Susan St. John, a Trustee of the Hurricane Island Foundation and a long time friend to the island and its various tenants, has just published her book about the years that Outward Bound was on Hurricane Island, entitled "To Sail Beyond the Sunset." To celebrate the book release, and to kick off the task of distributing pre-ordered copies, Susan hosted a gathering at the Apprenticeshop in Rockland. Bo Hoppin, Robin Chernow, and I attended, representing the Hurricane Island Center for Science and Leadership. I arrived close to the scheduled start time and found a room already crammed full of joyful faces, and I had a marvelous evening. I took our copy home and have been picking away at the stories over the past few weeks, and I've been reflecting on how I have come to feel a part of the Hurricane Island community. Volunteer Day, 2012: One of the the first times I went ashore to Hurricane. My kids were so young! I'm not an easy sell on sentimentality but generally can keep an open mind. (The first time I went ashore the reportedly magical Brimstone Island, I was disappointed. "It's just a bunch of rocks!" I wailed.) I had lived on an island, year-round, and was very happy to be settled in Rockland, where I could drive where I wished and go to the movies without seeing anyone I knew. So the first time I set foot on Hurricane, it was another island to me: infrastructure, facilities, windswept ledges, the remnants of the quarrying era scattered around the campus. I looked with an analytical eye and not a shred of sentimentality. It was early in the formation of the Hurricane Island Foundation, before a tremendous gift paved the way for us to rebuild the broken down buildings and get operations off the ground. 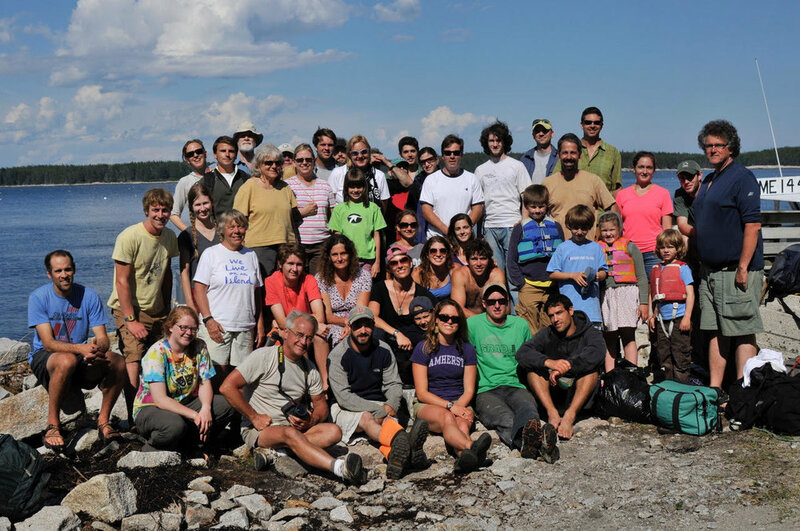 Sam and I (at left), along with other staff and board, greet guests on Hurricane Island at Outward Bound's 50th reunion, August 2014. I came into my position managing the development effort for the Hurricane Island Center for Science and Leadership knowing almost nothing about Outward Bound. I can't think of a single person I knew in high school or college who went on an Outward Bound course. People strongly associated Hurricane Island with Outward Bound, understandably since they had used it as a base for programming for 40 years! At the newly organized Hurricane Island, we were struggling to clarify what this new chapter on the island was trying to accomplish. "STEM ... hands-on experiences ... community ... implication for action ... leadership training ... making science relevant to students ..." Phrases bumped around in my thoughts as I tried to wrap my head around what we were going to become good at, what was unique, and how we would communicate this to donors, foundations, prospective program participants, other organizations. Many of our board members had Outward Bound DNA. I didn't quite know how to take them. They were warm, they were welcoming, they were supportive. They were smart, they were worldly, they were fun, and they were connected with each other in a way that seemed to transcend the passage of time. I could have been uptight about integrating myself into this community that existed way before I came around, but instead I relaxed and enjoyed the people around me. The conviviality was a bright spot in some tough early years as we got things going. July 2016: Staff, board, and friends bid farewell to guests from the dock. Photo Credit: Michael Hawley. But for me, Hurricane the Place was still a lot like Brimstone--lovely island with an interesting history and great charm, but not exactly magic. That changed for me when we opened up the island in August 2014 to host Outward Bound's 50th reunion. Our operations staff --quite small!-- scrambled to get the island ready; there were so many details that had to come together. Outward Bound's staff worked its tail off, too. It was a huge task, putting something like this together, having a 2-day event on an island for hundreds of people. A band! Lobster bake! Port-a-potties! Dozens of boats! A ferry cancellation! My role was to be present, to be available, to host. I had the luxury of spending that day in the Mess Hall with fellow staffer Alyson Graham, 5 months pregnant. I adored her and the team of help she had assembled. It was fun. Time slowed down. We made cookies to share with the guests using recipes that the Vinalhaven Historical Society had assembled from the quarrying era. People from various eras of Outward Bound history came in and out, seeing old friends, making new, feeling the flood of memories and the happiness of connection. It was utterly inspiring. A dinner line that lasted an hour was no problem--more time to get to know each other. A dance in the big tent on the South End lent an air of ecstasy to the night. We tipped the band; we begged them to play more. When there was no more dancing, there was a hike to the high Cliffs on trails I barely knew. I trusted myself in the hands of the people who had come before me. On that moonless night as we sat on those smooth, freshly varnished benches, it seemed we could see Portugal, or Brazil, way off, over there. And for the first time, I felt the magic; I fell in love. I'm not an Outward Bound alumnae, but maybe I'm an adopted daughter. Maybe I can help represent the bridging of the extraordinary connection found in the Hurricane Island community from the past era to the present. Many, many of the people whom we at the Hurricane Island Center for Science and Leadership consider to be part of our community were also part of the Outward Bound community when it was on Hurricane Island. Others who are new to Hurricane Island also fall truly and deeply in love with the place and the community. They can, and do, connect with the past community. And although we'll still identify people from time to time as "someone with a HIOBS background" or "someone new to the island," I think we're all part of one larger community. February 5, 2016: staff trip to Hurricane. The publication of Susan St. John's book To Sail Beyond the Sunset captures many of the stories that describe this connection. And to me, walking into her book release event last month exemplified the meaning of community as something that transcends place and time. I didn't know more than a couple of her guests before I started working for this organization six years ago, but when I entered that room, I found myself continuously gasping with elation at seeing each of those faces. The next morning I wrote down a list of names of the people I connected with. It was long. Really long. And it was full of friends--not just people I know but people I love. Susan's book synthesizes what a blessing it is to be a part of this community.